MADISON, WIS. - U.P. 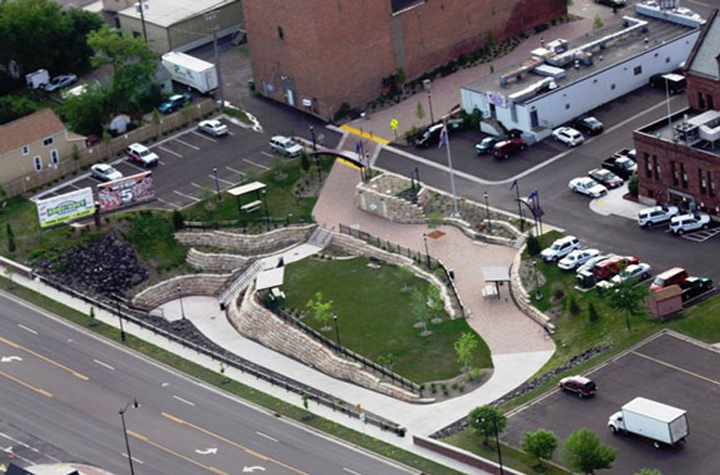 Engineers & Architects, Inc. received an urban design award for its work on an innovative downtown plaza in Ashland, Wis. that provides a crucial link between the waterfront and business district. The award was presented by the American Planning Association-Wisconsin Chapter at the Upper Midwest Planning Conference in Madison, Wis., to the City of Ashland and UPEA for the Howard Pearson Plaza project. The APA-WI Chapter Urban Design Award is given to an "urban design concept for a new or redeveloped area of unusually high quality and design". The project was reviewed based on five criteria: Originality and Innovation; Value Added to the Community; Quality of the Physical Form; Relationship to the Natural Environment; and Long-term Sustainability. The project was juried by a panel of distinguished urban planners from the Minnesota Chapter of the APA. One juror said "I am very impressed with Ashland’s pedestrian underpass and plaza. It’s great to see a community connect downtown to their waterfront. Encouraging active living is a bonus. I would certainly want to stop and enjoy the view." The City of Ashland was very honored to receive this award for the project, designed to create a comfortable and safe pedestrian connection from the downtown to the City’s Lake Superior waterfront. According to Katie Meyer, Ashland’s Planning Director, "the plaza is a delight to residents and visitors alike" and has spurred more interest in creating exciting public spaces in the city. The award was received on behalf of the company by UPEA’s Senior Planner Patrick Coleman, AICP. Coleman said that "people want to work, live, and visit interesting places that incorporate history, cultural and natural landscapes." Coleman said that “placemaking” has been recognized as a key to economic development and livability. “Successful communities pay attention to the details of good design and making incremental improvements to enhance walkability and downtown revitalization. “Downtowns in the Upper Great Lakes region need to remain focused on providing amenities that attract customers and businesses,” Coleman said. "The Howard Pearson plaza project, designed for pedestrian use in all seasons, is a key placemaking investment that will pay back huge dividends for future generations," he added.